I was on the verge of abandoning this blog. I questioned my motives- why even blog at all? Why spend hours sewing for the girls now that much of what I was making ended up unworn in their closets now that they have their own ideas of fashion! Their changing ideals, and my concerns over cyber saftey and honestly the lack of energy to force them to pose for the pictures left me feeling tired and just “over it” with blogging. Altough I plan on posting the occasional “small” sewn item here, I have decided to ressurect this blog and feature items I have sewn for myself. yay! I have decided to conquer my self doubt, body issues and feeling like an idiot posting for photographs. Yikes. But really, I like blogging. I love sewing. I love connecting with others with the same passion for it and I have been missing it these past few months. Inspired by the new site Curvy Sewing Collective and some recently acquired patterns (with extended sizes!) I have discovered I love sewing my own clothes. 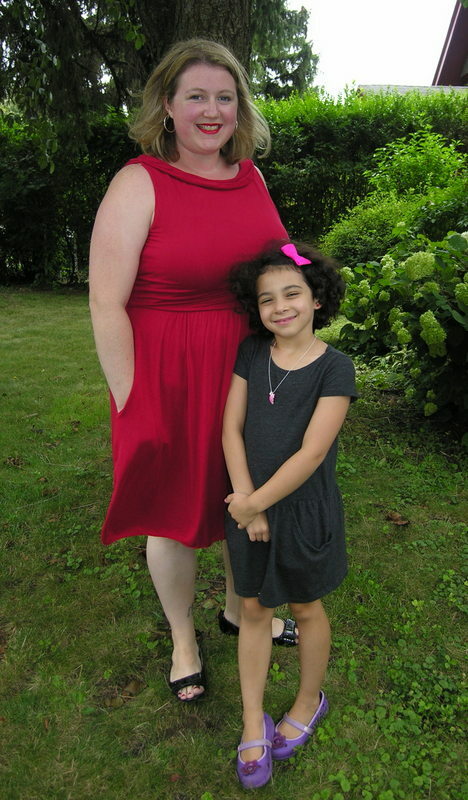 While I miss being able to whip up a kids dress in under an hour with 1 yard of fabric, I love being able to tell people the clothes I am wearing I made myself- even at my 20 year High School Reunion. So cool. So- for my first post about my selfish sewing….Here we go! What feels better than wearing your pajamas? Wearing a hot red dress that makes you appear put together and bold but feels like you are wearing your favorite nightgown! My new favorite pattern- Collette’s Moneta dress. When I started thinking about what to wear for my upcoming Reunion (it was this past weekend- so fun!) I knew I wanted to be comfortable, classic and modest enough that I felt good about myself and my figure. Taking a risk by sewing up a pattern I have never tried before I dove right in ordering the pdf version of the Moneta dress online and spending hours the next night cutting and taping together the pattern pieces. What a pain. I really hate pdf patterns for this reason but nothing beats the instant gratification of not having to wait days for a pattern to be shipped right? Anyways, one night spent taping and cutting, another night spent cutting the fabric pieces and the following afternoon sewing up the dress and voila! I chose to make the sleevless version pictured with the lined bodice and collar. My all time favorite dress EVER! I find that the first time I use a pattern I am super duper slow at putting it together…this took around 3 hours of sewing time- but I am confident that the next one I make will take far less since I won’t be so nervous about making a mistake. For the fabric I purchased 3 yards of a red jersey fabric from Joann’s (on sale)- unfortunatley the only fabric store in town with a selection of knit fabric. It worked out perfectly- had great stretch and drape and lightweight enough for a summer event. I even purchased matching thread and serger thread- I didn’t cheapen out and try to use what I have at home- what a difference. The clear elastic used I found at Tuesday morning- it is 3/8 inch instead of the 1/4 inch noted in the pattern but it worked out well and was surprisingly easy to use…I think I have found a new method to gather skirts from now on. The only change I made was to simply serged the hem rather than spending time figuring out how to use my twin needle. It wasn’t noticable since I matched the thread and the skirt is so swingy and full but I plan on doing it the right way next time for sure. The fit of this dress was pretty spot on- except for the armhole area which I have heard is a common problem. Gaping arms- ugh. I think I am going to have to alter the pattern a bit if I make another sleeveless version to avoid having to constantly do a bra check. I already can’t wait to whip up another one and am eagerly awaiting a shipment of ponte fabric from girlcharlee.com. Next up- a 3/4 sleeve version. Seriously I might end up with an entire wardrobe of these.